From a historic streetcar suburb with vintage factories to urban condos overlooking an eclectic arts district, Charlotte's diverse neighborhoods make the city what it is. Whether you're looking for the tree-lined opulence of Dilworth and Myers Park, the arts and food of NoDa, or the shopping of SouthPark, each neighborhood is truly unique. Charlotte's downtown area (or, Uptown as locals refer to it) is the nation's second largest financial district by day. At night it's the place to be, with some of the hottest nightlife spots the city has to offer. Uptown and the area known as the Fourth Ward have also become the place to live. Luxury condos have sprung up everywhere and many renovated historic homes and buildings offer walkers a glimpse into the past. Most of Charlotte's museums and live theater venues are in Uptown as well. You'll also find some of the best dining in the city and there are a number of opportunities for free activities. NoDa, or North Davidson, is Charlotte's Historic Arts District. It is home to many eclectic art galleries, live music venues, and local eateries. Plaza Midwood is an emerging area near NoDa featuring many famous local restaurants like The Penguin and Dish. For the foodie and the art lover, these two neighborhoods should definitely be on the itinerary. Myers Park is one of Charlotte's oldest neighborhoods and features the best housing money can buy in town. It is just a few blocks from Uptown and it's an excellent place for a casual stroll. In Myers Park, you'll find tree-lined streets and stately homes. It's also the place to see the best churches in Charlotte, which is renowned for its places of worship. You'll want to stop by the Little Church on the Lane and will marvel at the towering architecture of Myers Park Methodist Church. Dilworth has transitioned into a thriving neighborhood with Freedom Park as its centerpiece. 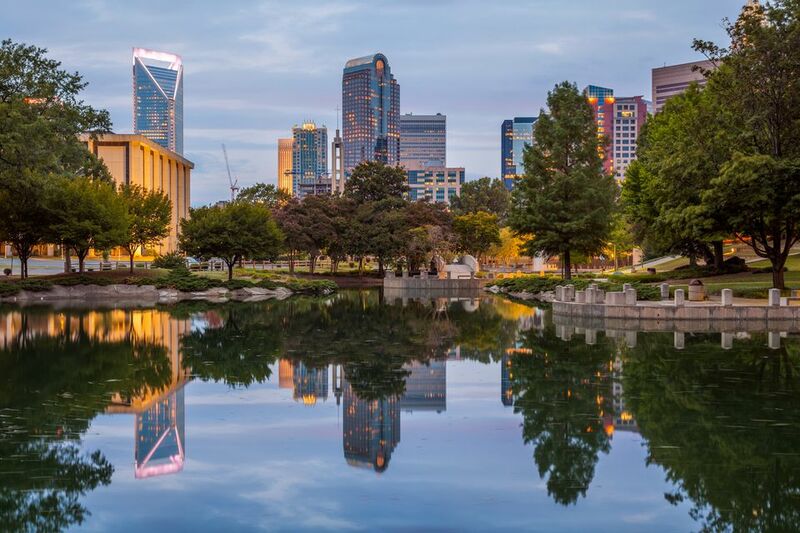 This 98-acre park includes a 7-acre lake that is a welcome surprise in the city and certainly adds to Charlotte's charm. In September, be sure to stroll through Freedom Park during the annual Festival in the Park. It's a free event that features the work of many talented artists from the area and has been named one of the "Top 20 Events in the Southeast." SouthPark is home to the SouthPark Mall, which is the epicenter of the neighborhood. In fact, it's one of the largest malls in North Carolina and boasts many of the big name stores. Outside of the mall, you'll find several other businesses and places to shop. Dean & Deluca at Phillip's Place is one place you'll want to stop for a quick bite or a few groceries. South Charlotte is loosely defined as anything south of Uptown, extending into neighboring Union and York counties. It is one of the fastest growing areas of Charlotte and includes the neighborhoods of Ballantyne and Arboretum. Arboretum is primarily residential but is home to the Arboretum Shopping Center from which the neighborhood got its name. Ballantyne has a little of everything city life has to offer, including business, shopping, and hotels. Highlights for visitors include the Ballantyne Resort and Spa and the Dana Rader School of Golf. The town of Matthews neighbors Charlotte to the southeast and is also in Mecklenburg County. It's a charming suburb and you'll find a few fun things to see and do there. The Matthews Community Farmer's Market is a fun Saturday morning activity and it's located next to the charming Renfrow's Hardware Store. You'll also enjoy walking or biking the Four Mile Creek Greenway and playing at Stumptown Park. Want to catch a movie? You can't beat the prices at Cinemark Movies 10. Trust us on this one. Just 15 miles northeast of Charlotte lies Concord. It offers a lot of fun for the whole family and is home to NASCAR's Lowe's Motor Speedway. It's a destination for race fans, but there's more to it than fast cars. Concord Mills is the area's largest shopping mall. If you thought your shopping spree ended in SouthPark, head out to Concord. You'll also find the Great Wolf Lodge in Concord. This is an indoor waterpark that will keep the kids busy. You can relax in the spa and take in a great meal at the restaurant.